Craig Bowers Illustration: Spidey Sense, Tingling! 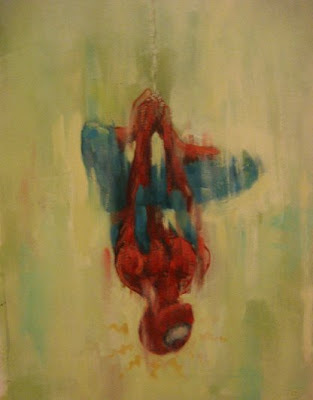 A local gallery is having a show with the theme "Superheroes." Needless to say, I had to hop on it. Unfortunately, I only had a week to do it. 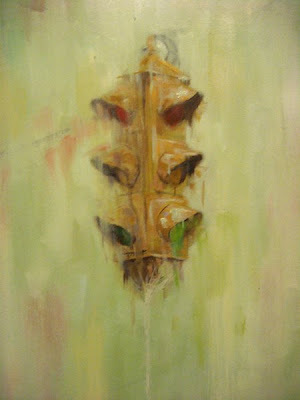 Im pretty happy with the traffic light, but Spidey could still use some work. Oh well. Recent stuff's looking good, guy. That is a sweet traffic light. Keep an eye on your Jean influences, though. Understandable, but my main influences were actually alex kanevsky (figurative)and Kim Cogan (landscape). They're both all about the vertical brush strokes. But yeah, I can't deny that Mr. Jean creeps into my work here and there. i have to say, though - those are some greatly exaggerated pecs. I agree with Cam, super saturated colors tend to suit marvel an dc characters best. I only see JJ's influence in the background (it's reminiscent of maze). Spidey and the traffic like don't look like something he would do. I'm really impressed by your newer pieces. Keep it up dude. Haha im enjoying the criticsm, thanks guys. I'm usually more attracted to muted palettes. Not muddy, but definitely muted. One of my least favorite things about main stream comics is the prevalence of super saturated and unrealistic colors. They clash with one another and often have no harmony to me (not including Alex Ross, obviously he's unreal). In this, in person it's more obvious, I used muted colors, like mixing grey and complimentary ones for the majority while choosing little areas to use saturated ones to emphasize focus. Unfortunately I was rushed and didnt do it as well as i could have, but hey. Some pieces work, some don't. It's all part of the fun. Seriously if I could eat this guy to get his talent I would. Check it. Sorry if I was unclear -- I only meant that the treatment of the background reminded me of his work a little too much, especially compared to the rest of the piece, which is totally different stylistically. No worries!